I love my H&M poncho, but I really use it like a jacket which means once I arrive to where I am going I have to take it OFF. 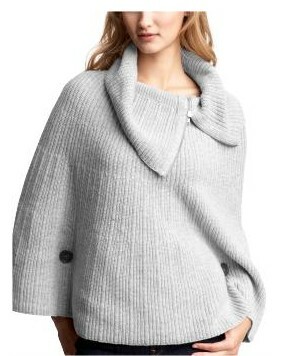 The Gap has come out with a poncho sweater which is absolutely adorable! It’s something you wear while at a function keeping on trend and in style for under $80. This weekend will be LOADED with sales. If you are in the market for a poncho sweater – head on over to the Gap nice and early because I have a feeling this piece won’t stay on the racks for long.